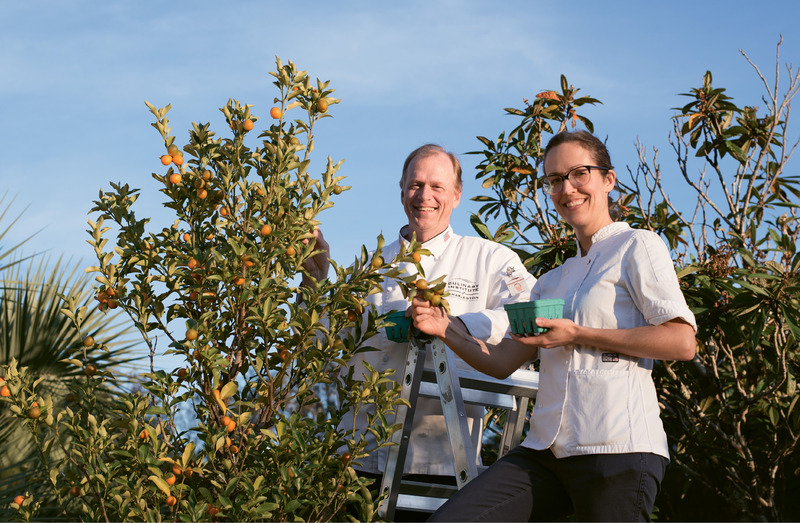 A Bird’s-Eye View: Melanie Durant among the kumquat trees with Bernd Gronert at his Cypress Hill Farm. 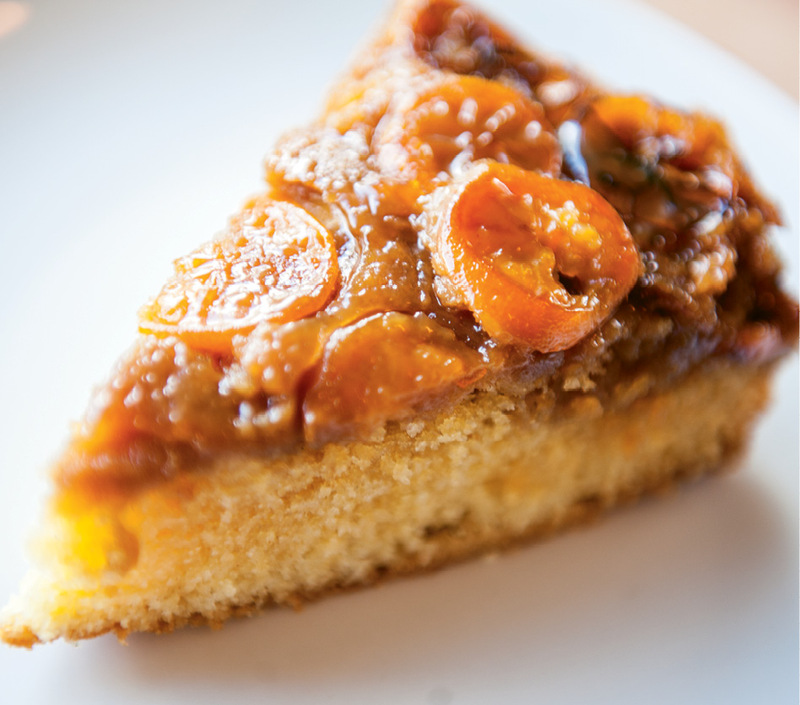 Morning Treat: Kumquat slices and a sticky streusel top the soft, buttery coffee cake. Raising the Bar: The sticky fruit jam acts as a binding agent to hold the dough together. Before serving, dust the three-inch squares with powdered sugar. 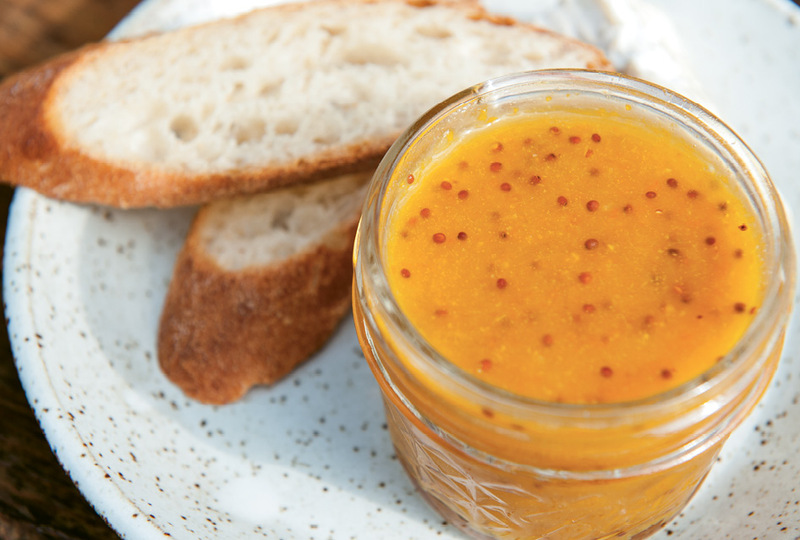 For Melanie Durant, the 2013 Food & Wine “Best New Pastry Chef” who is always up to her elbows in sugar, the kumquats at Bernd Gronert’s Cypress Hill Farm were a first. Though Durant’s experience with the fruit included creating “a champagne gelée with kumquats and a kumquat and white-chocolate ganache for a gingerbread cake filling,” she hadn’t experienced the prolific Lowcountry citrus fresh off the tree. The fruit’s flavor, with its sweet rind and slightly tangy interior, is so rewarding, says Durant. “They taste like a perfect marmalade and have the same texture as an orange—only a little chewier.” Put simply, developing recipes with them wasn’t difficult for her. 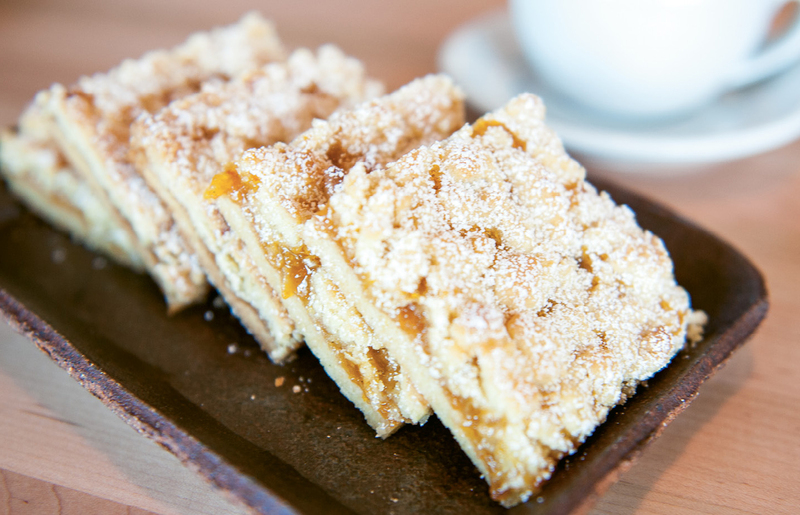 First out of the oven is a kumquat coffee cake, which Durant describes as a “soft buttery cake with a sticky streusel topping studded with fruit,” perfect for a chilly morning treat or alongside a late-afternoon mug of tea. The chef’s professional training peeks through, as the butter is browned and the cake is served inverted, displaying the kumquat slices on top—reminiscent of a classic tarte tatin. Cypress Hill Farm kumquats are typically ready to be picked by the first of December. Unlike the oval Nagami varietal found in supermarkets, Cypress Hill’s are the round Meiwas, sweet enough to be eaten whole. Look for them at the Summerville Farmers Market; GrowFood Carolina also distributes them to grocers and chefs. You might try growing them yourself—learn about three varieties that do well in Lowcountry gardens at www.charlestonmag.com/features/little_gems.